Prophet Shepherd Bushiri (file photo). Cape Town — Shepherd Bushiri has been arrested, according to a post on the controversial self-proclaimed prophet's Facebook page. "They took the Prophet and our mother Prophetess Mary Bushiri in handcuffs to Pretoria. They have charged our father with fraud and money laundering," the statement reads. Bushiri and his wife were allegedly arrested by the Hawks police unit and face charges of fraud and money laundering, EWN reports. 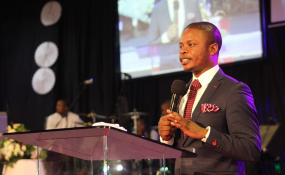 Last year the Sunday World reported that the Hawks were investigating Bushiri for money laundering after senior members of the Bushiri's church, the Enlightened Christian Gathering, claimed he was sending an estimated R15-million a month to his home country of Malawi, writes the Sowetan.